We always want our computers to be clean and well organized so that whenever we need to access something or need to search a particular file/folder in our computer we could find it easily and quickly. As similar to that, here I am going to share a free software through which you can easily assign your favourite colours to your desired folders in order to differentiate them easily and to ease of access. 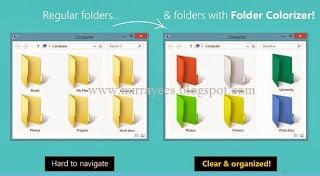 Click to view the preview of customized folders indifferent colours. Now Question is how to customise folders with different colours as shown in preview. First of all Download and install the software Folder Colorizer. It is tested and 100% virus free. You can download it from the official site by clicking here: DOWNLOAD FOLDER COLORIZER. Now after installing the software, simply right click on any folder which you wish to customize as shown in below Screenshot. Here when you right click on folder, you will see a new option in the context menu i.e. Colorize! Now simply go to that option and one sub menu will appear. Now choose any colour you want to assign to that folder. Although it is a free software for everyone to use it but while you will use this software for the very first time, it will just ask your email id for activation of this software. But no need to worry because you won’t need to confirm the activation by logging in to your e mail account. Even if you don’t wish to share your e mail id with developers of this software you can do it because product will be activated automatically once you enter any email id. So you can also enter any fake id if you want. In this way you will be able to easily organize folders in any of your drive weather C, D, E or any other drive. You can also assign different colours to several folders in the same drive to give it more attractive and cool looks. If any Problem occurs use the comment box.